The Beomaster 6000 was offered as a smaller, slightly cheaper alternative to the Beomaster 8000. Making the two models visually similar served a dual purpose, firstly it suggested that they were both variations of the same theme and secondly it allowed the same range of sources to form a complete system with either Beomaster. That being said, a range of 6000 series sources were offered, though the 8000 sources remained an option if higher quality was required. Both Beomasters could also be used with the Beocord 9000. The Beomaster 6000 was distinguished by its black keys, as were the other items in the 6000 range. Text copyright © Beocentral. Unauthorised reproduction prohibited. The Beomaster 6000 (and the rest of the Beolab 6000 system) represented the middle step of a 3 part range that started with the Beocenter 7700 and was completed by Beolab 8000. This rage offered a doubling in power at each step, with the Beomaster 6000 producing a healthy 75W. The other important feature of this range was microcomputer control, which the Beomaster 6000 featured in a simplified form, when compared to Beomaster 8000. What the buyer got for their money was an FM receiver with a pre-tuned radio section, a powerful amplifier and a programmable timer. This was similar to what Beomaster 8000 offered, but as we shall see the differences were more than a matter of scale. Text copyright © Beocentral. Unauthorised reproduction prohibited. While the Beomaster 8000 was a no-compromise statement, demonstrating the peak of what was possible, the Beomaster 6000 had the feel of a more standard product subject to more familiar limitations. The first of these could be seen in the cabinet work, which on inspection could be seen to have come from the Beocord 8000. A finned amplifier compartment at the rear was added to match the Beomaster 8000 style, though it was not constructed in the same manner. Adapting the Beocord cabinet to house a receiver was done well, suitable controls were fitted to all the openings whilst the hole where the cassette would have gone was plugged with an infill that contained the tuning controls. The level controls now adjusted the treble and bass and switches and buttons for the tuner and timer filled the other positions. Overall, a good job was done and the product looked convincing. In some ways it matched the Beocord better than Beomaster 8000, which in comparison was rather large. Text copyright © Beocentral. Unauthorised reproduction prohibited. The audio circuitry was considerably simplified. Much of it was carried over directly from the Beomaster 4400 and features like split supplies and numerous operational amplifier ICs that were used in Beomaster 8000 were not present. The major change in the pre-amplifier from the 4400 was the use of an electronic source selector to replace the mechanical switches. Unlike the 4400 and 8000, it was not possible to adjust the level of the individual sources. The power amplifier followed 4400 practice very closely, though for some reason the power supply voltage had been increased, though no extra power resulted. The “Dual mono” construction of the Beomaster 8000 design was not present, instead a single power supply fed a single stereo amplifier unit. The space allowed a generous heatsink to be fitted, though despite this the Beomaster 6000 always ran hot, causing some failures in later life. A feature of the Beomaster 4400 that was removed was the “overload” indicator, an odd omission as the 8000 had one. Text copyright © Beocentral. Unauthorised reproduction prohibited. The final detail of the amplifier gave the Beomaster 6000 its greatest novelty: the volume control. To show the linkage between the 6000 and 8000 ranges it was desirable to give both receivers volume controls that operated in a similar manner. That meant that the Beomaster 6000 would require some sort of “electronic” volume control that worked without traditional knobs or sliders and could be operated remotely. The Beomaster 8000 used precision electronic attenuators for this purpose but these were too complex and too expensive for the 6000. Instead, a conventional rotary potentiometer was used, but this was motorised and buried deep within the machine. Motorised controls had been used by B&O before in the Beomaster 6000 4 channel, but this had used a simple system where the only control modes were “up” and “down”. By adding a servo feedback system, the volume control action of the new Beomaster 6000 was made more versatile, the volume could be adjusted in four separate ways. The first way was directly, using the “up” and “down” keys on the main operating panel. The second way was in “reset” mode, where the volume control was slaved to a sliding potentiometer on the secondary operating panel under the hinged aluminium lid. This control occupied the same place as the headphone level control of the Beocord 8000 and when the “reset” key was pressed the servo set the internal control to the same position as the slider. This mode was used to set the volume at which the Beomaster played when first switched on, and on pressing “standby” the last action of the system was to return the volume to this setting. The third method was to use the “direct access” keys which rapidly set the volume to any one of seven settings evenly distributed over the control range, from zero to maximum output. These controls were not well designed, as it was easy to press the highest setting key (60) by mistake, because it was positioned close to the source selection keys. Despite the fact that a “0” setting was offered, this did not guarantee to silence the output completely, so a “mute” key was fitted as well. The fourth and final method of setting the volume was by the optional remote control, which offered “up"/"down” keys and access to the “10”, “30” and “50” direct settings. The Beomaster 8000 had been given a numerical indicator for volume level but this was not really practical with the 6000. Instead, a sliding “bar graph” display was fitted which looked similar to the level indicator of the Beocord 8000. However, this display was not electronic; it was mechanical and worked by progressively uncovering a pair of small light bulbs which were filtered through red transparent plastic. This assembly was driven by a cord drive wound around the volume control and looked far more “high-tech” than it actually was. Text copyright © Beocentral. Unauthorised reproduction prohibited. The volume control methods gave an insight into the essential difference between the microcomputer fitted to the Beomaster 6000 and that of the 8000. The 6000 system was greatly simplified and all functions had to operate without the use of an electronic memory. We have already seen how the volume control could be made to home to a user-defined setting, this was an excellent example of the methods employed. The other aspect of operation where Beomaster 8000 relied on its memory was the tuning. Stations were tuned and stored in the manner of the latest sets of today, though this was a far greater technical challenge in 1981. The Beomaster 6000 went without this sophistication and instead retained the traditional B&O layout of pre-set tuning potentiometers, one for each of the 6 pre-tuned programme positions. It was still desirable to provide a digital frequency readout however, so when used as a radio the Beomaster display became a frequency counter which measured the frequency to which the radio was tuned. This simple “open loop” system was completely different to the “frequency synthesiser” used in the 8000, though the use of powerful AFC made the difference in practice seem surprisingly small. The designers had even managed to mimic the 8000’s “automatic” and “manual” tuning modes to some extent by including switchable inter-station muting and linking this with powerful AFC. The manual tuning control took the form of a wide, heavy edgewise wheel whose smooth action made scanning the FM band a real pleasure. Unlike the 8000 stations could not be stored as they were located, instead the frequency would have to be noted and then one of the smaller pre-set tuning thumb wheels set to the same figure. The Beomaster 6000 was fitted with a “tuning balance” indicator (which the sophisticated 8000 did not need) and an LED signal strength meter, which looked more attractive and matched the rest of the set better than the pointer instrument fitted to the 8000. Text copyright © Beocentral. Unauthorised reproduction prohibited. Unlike the Beomaster 8000, the 6000 was fitted with a built-in clock and timer. This was made necessary by its less sophisticated Datalink interface that did not allow the Beocord to control the Beomaster to the same extent, making it necessary to programme both units separately. In compensation, it did allow the Beomaster 6000 to be used as a (very large and expensive) clock radio, something that was not possible with the 8000. Text copyright © Beocentral. Unauthorised reproduction prohibited. 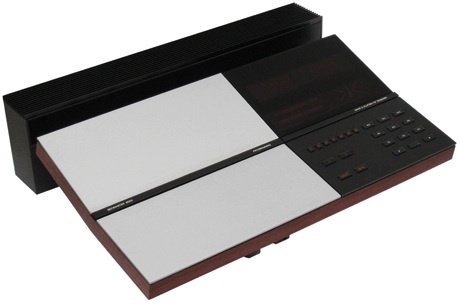 Like the Beomaster 8000, the Beomaster 6000 could be used with two tape recorders. In some ways the arrangements were more resolved in the 6000, though off-tape monitoring was not possible. The second recorder was connected via RCA Phono plugs only and signals were adjusted to “line” level, making the connection of a wide range of Japanese and other standard equipment easy. Later on the Beogram CD X compact disc player could also be connected here simply. Text copyright © Beocentral. Unauthorised reproduction prohibited. The Beomaster 6000 could be fitted with a remote control at extra cost. This infra-red based system used a similar terminal (the “Beomaster Terminal”) to that provided as standard with Beomaster 8000, though some of the functions had been redefined. Control of a tape deck and record player was still possible, though TP2 could not be selected remotely, an omission as it made it difficult to return from checking a radio broadcast whilst listening to a compact disc for example. The same casing was used for the Beomaster Terminal as was employed for the 8000 “Beolab Terminal”, meaning that all the position for buttons had to be filled, despite the system being simpler. This lead to the inclusion of the “EXT” key which one would think controls the external loop-out for an equaliser/filter but in fact has no function at all. Text copyright © Beocentral. Unauthorised reproduction prohibited. The Beomaster 6000 did succeed in offering a Beomaster 8000-type experience whilst being slightly less extravagant in terms of money and space. However, once the optional remote control had been fitted to the 6000 the difference in price was surprisingly small, making the smaller model seem poor value for money. One could certainly not argue the opposite – that it made the 8000 look cheap! Despite this, the Beomaster 6000 outlasted the 8000 by some years and held the position of the most powerful and most expensive Beomaster throughout the mid 80s. It was the last Beomaster model made that exceeded to power output of the Beolab 5000 system of 1967. Even this though did not stop the Beomaster 6000 looking old fashioned and basic compared to the new Beomaster 5000, which for less outlay offered complete integration with a system of matched source components, random digital pre-tuned radio programmes on AM as well as FM, remote control of all functions including every amplifier function, tuning and programming and a modern compact style that was more easily integrated in modern homes. Text copyright © Beocentral. Unauthorised reproduction prohibited.